Finally, a kneeboard strap to hold your iPad or other tablet with the thickest of original cases. Keep your iPad secure on your thigh while surfing, typing or working with your favorite application... or even while flying! 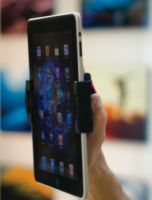 The MyClip Palm is the easiest lightest way to securely hold your iPad or tablet computer.